The first Fisker Karma will be delivered later this month, with the company claiming to secured 3000 pre-orders for the radical range-extended four-door performance car. The Mercedes CLS-sized Karma is the work of former Aston Martin designer Henrik Fisker, and has been developed around a bespoke aluminium spaceframe chassis. Its powertrain consists of a mid-mounted battery pack and twin rear-mounted electric motors, with a 260bhp 2.0-litre turbo four acting as a generator when electric power is depleted. Film star Leonardo di Caprio will take delivery of the first production car, with high-profile buyers including Al Gore and Colin Powell set to follow. At present five cars a week are being built at the Valmet production plant in Finland, with production set to rise to 300 cars a week from November. 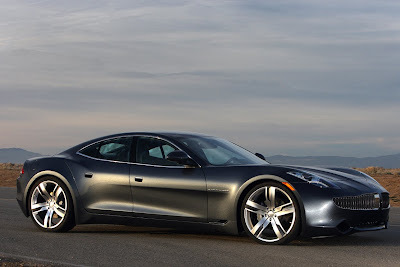 Consequently Fisker estimates the $100,000 car (set to cost around £95,000 in the UK after taxes) is sold out until early 2012. Saloon, convertible and shooting-brake models of the Karma will eventually be produced, with the latter set to be unveiled at the Frankfurt motor show in September. Subsequently, in 2013, a smaller, four-door range-extended BMW 3-series rival will be launched, which is currently known as Project Nina. Again, there will be three bodystyles and it will cost from $50,000, although unlike the Karma it will be available in left and right-hand drive. Fisker estimates it will sell 100,000 Nina models a year, making it one of the best-selling alternatively powered vehicles when it goes on sale.